1 Gently melt the Flora Buttery in a medium deep, heavy frying pan. Add the flour and whisk together to get rid of any lumps. Cook the roux over a very low heat whisking continuously. 2 After 2-3 minutes, add a little milk to the roux and whisk again, mixing thoroughly. Continue gradually adding the milk a little at a time, whisking constantly until all the milk has been added. Bring to the boil. 3 Add in the Knorr Fish Stock Pot to flavour the sauce and whisk until dissolved. Reduce heat to a simmer and add in the Elmlea, if using, and whisk in thoroughly. 4 Carefully place the fish in the pan, shaking the pan to coat the cod in the sauce. 5 Poach the cod in the sauce over a low heat for 4-5 minutes without allowing the sauce to come to the boil until the fish is cooked, carefully turning over each piece of fish after 2 minutes. Sprinkle over the parsley and shake the fish to coat it in the parsley sauce. 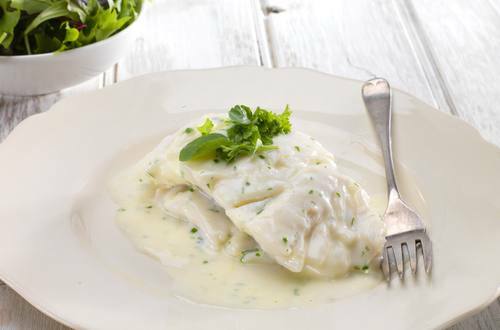 6 Carefully transfer the fish to a serving dish, spoon over the parsley sauce and serve.